Racers are always happy with the best. And that’s the competition D211 GP, a race tyre that has won consistently at every level of world motorsport - club, national and international – since its launch. Now, the secrets of this all-conquering tyre’s extraordinary success are being made available to the committed road rider. 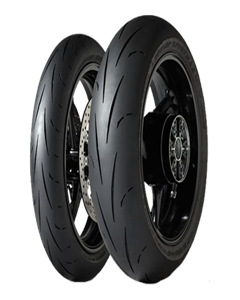 The new road-going Sportmax GP Racer D211 tyre’s Multi-Tread compound delivers superb grip, precise feedback and slow wear rates for longer life, and the revolutionary NTEC system provides pressure tuning options that will satisfy the most hard-core track day fanatic as well as the pure sports rider, without compromising mileage.